Back cover blurb: NOW. Living in her home in the remote countryside - the perfect place to get away from it all - Helena is a career woman with no job and a mother without a baby. She blames Ashley for destroying her life. But is what happened really Ashley's fault? THEN. When Helena hires Ashley to work for her, she's startled but impressed by her fierce ambition. They form a dream team and Helena is proud - maybe this is the protégée she's always wanted to have? But soon Helena realizes that nothing will stand in the way of Ashley's drive to get to the top. And when Helena becomes pregnant, everything she has worked so hard for is suddenly threatened, with devastating consequences... 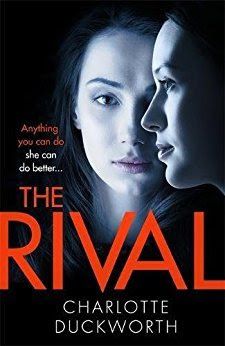 The Rival is an addictive psychological suspense about ambition, female rivalry, and how far you'd go to get what you want. Helena is a high flying career woman when she employs Ashleigh\Ashley an ambitious but inexperienced young woman. Helena is initially shocked, but then impressed at how badly Ashley wants to progress within KAMU (Kiss And Make Up). Helena encourages Ashley’s ambition, after all, she has always wanted to mentor someone successfully. When a new project comes along, Helena realises that perhaps she has underestimated Ashley’s ambition, but once again encourages it, as they become the new office dream team. They are formidable together and really want to make the new project a success. Then Helena discovers something that threatens to shorten, or at least significantly change her successful career. She confides in Ashley, believing that the young woman will be supportive, but doesn’t get the support she so badly needs. Quickly the dynamic changes between them, Helena begins to feel sidelined by her protege and as time goes on, begins to realise that ambition can be a very dangerous weapon indeed. Without saying too much more, The Rival is a novel that shows just how far some women will go to get what they believe they deserve, no matter who or what they harm in the process. A must read. The Rival is available to buy now via Amazon online and all good book shops.